Herbed Cream Cheese Cucumber Crackers are the perfect appetizer for spring entertaining. Made with a combination of fresh herbs and cucumber slices, this recipe takes only 10 minutes to make! It seems that when spring arrives, get-togethers, parties, baby showers, and so on, make a come back as well. It also means saying goodbye to all those delicious, stick-to-your-ribs comfort foods, and hello to more fresh fruits and vegetables! 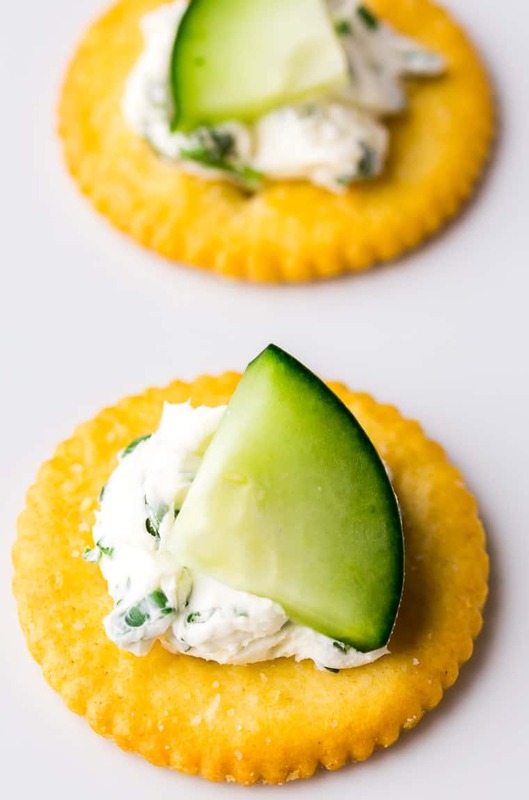 These Herbed Cream Cheese Cucumber Crackers are the perfect snack for spring entertaining. When the weather is beautiful, I don’t really want to be baking and cooking in a hot kitchen. I want to be enjoying the day and the company of my friends and family. Easy appetizers and finger foods, that are incredibly delicious, are a must! This super easy recipe is actually a twist on classic Cucumber and Cream Cheese Tea Sandwiches. Instead of bread, crackers provide the perfect crunchy base for cream cheese blended with a combination of fresh herbs. A slice of crisp cucumber tops them off! 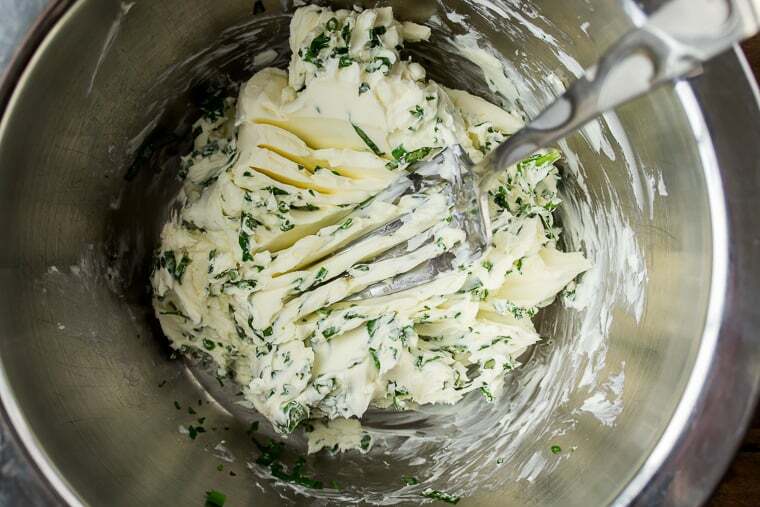 Fresh herbs provide a more intense flavor to homemade Herbed Cream Cheese Spread. This recipe only takes around 10 minutes to make, making it a great appetizer or snack option when time is limited. Extra Herbed Cream Cheese can be used on bagels, sandwiches, and wraps! You want to be sure to set your cream cheese out about an hour before you need to it allow it come to room temperature. This will make mixing in the herbs and spreading the cream cheese onto the crackers much easier! 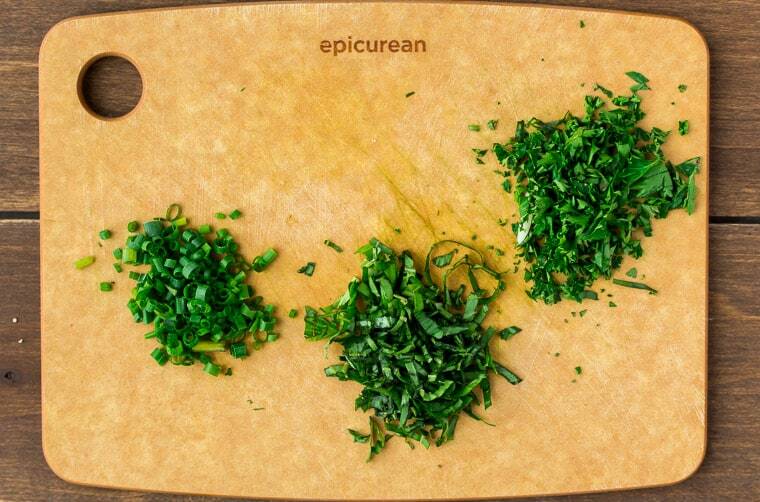 Finely chop the herbs and cut the cucumber into slices that are about 1/4 inch thick, then cut each slice into quarters. Mix the herbs into the softened cream cheese until well-combined. 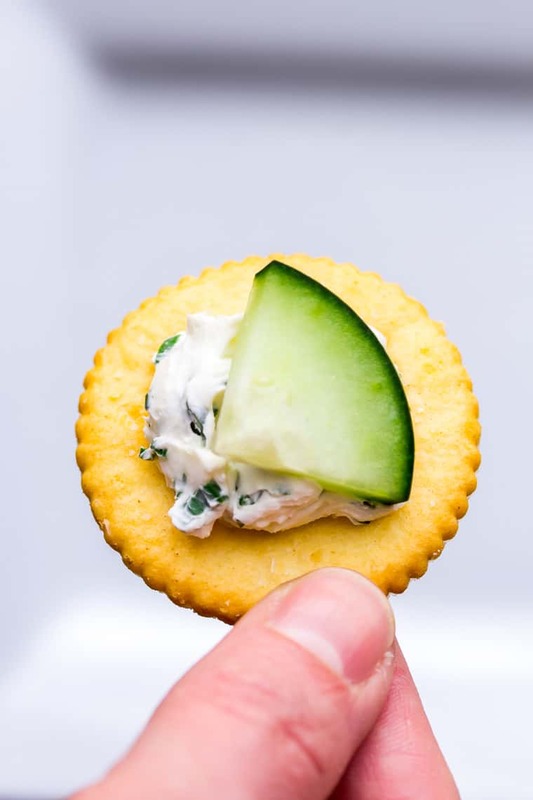 Spread the cream cheese onto the crackers and top with a piece of cucumber. Place the Herbed Cream Cheese and Cucumber Crackers onto a serving tray. 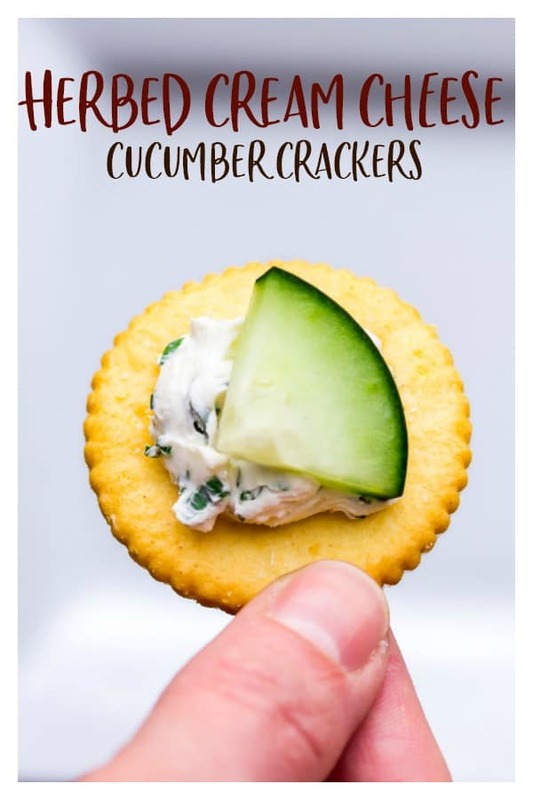 Alternatively, you can set out a bowl of the Herbed Cream Cheese, crackers, cucumber pieces, and cheese spreaders for guests to assemble their own crackers. Make sure to set the cream cheese out at least an hour before you need it to allow it to come to room temperature. Any combination of fresh herbs can be used. I prefer to use chives, basil, and either dill or parsley. Add a clove of minced garlic to make a Garlic Herb Cream Cheese, if preferred. What herbs are best to use in Herb Cream Cheese? You can use any combination of fresh herbs, but chives, basil, dill, thyme, oregano, and parsley are the most commonly used. What is Herbed Cream Cheese used for? Herbed Cream Cheese is commonly used as a spread or dip for crackers and vegetables. You can also use it on sandwiches, wraps, bagels, and so much more! 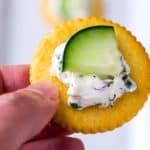 Love this recipe for Herbed Cream Cheese Cucumber Crackers? Follow me on Pinterest, Instagram, and Facebook for more! 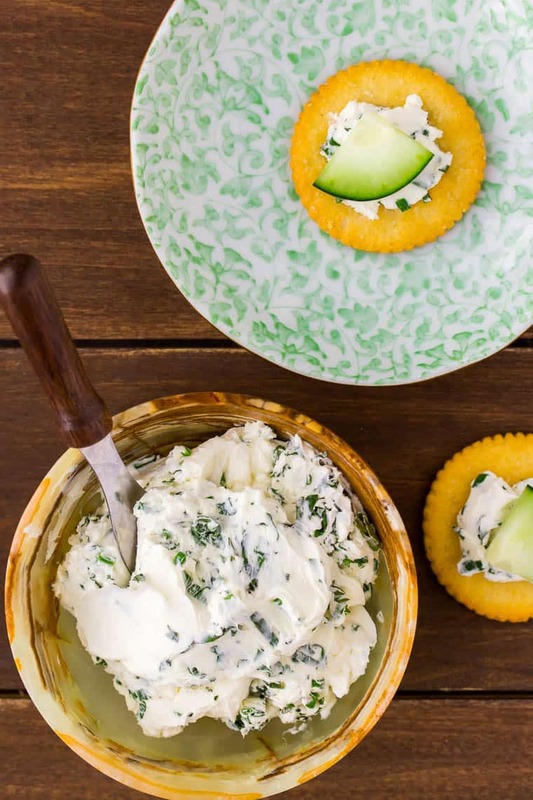 Herbed Cream Cheese Cucumber Crackers are the perfect appetizer for spring entertaining. Finely chop the chives, basil, and parsley. Cut the cucumber into 10 slices that are about 1/4 inch thick, then cut each slice into quarters. Spread the cream cheese onto the crackers and top each with a piece of the cucumber. This recipe was originally published on April 10, 2017. The post was updated in March 2019 with new images and text to include tips, techniques, and FAQ’s. I like how easy these are, great for snacking on at a party. Now this is a simple and beautiful treat that I can serve up at holiday parties! What a great starter! Great recipe! I love Ritz crackers. And I’m loving those little plates too! Nothing says Spring Party like yummy cream cheese full of herbs! Makes me wanna organise a bbq party 🙂 Looks delicious and easy to make to entertain lots of people! I want to snack on these right now! I love little snacks like these.